Anyone can learn to play the ukulele, and play it well. No previous knowledge of music is necessary. Strum and pick both harmonies and melodies. First Lessons Ukulele provides a simple approach for learning how to play the ukulele without reading music. 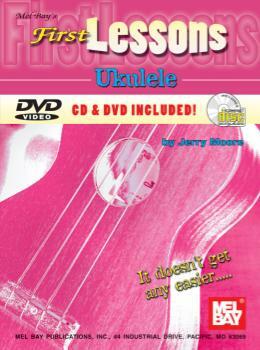 From the most basic necessities, such as holding the uke properly and forming simple chords, up to more advanced techniques, which include transposing, using second and third position chords, and picking and strumming melody solos. Companion CD/DVD included. •	No previous music knowledge necessary. •	Strum and pick both harmonies and melodies. •	Takes you from basic skills such as forming simple chords, to advanced techniques, such as transposing and soloing.